Progressive loss of pulmonary function leads to early morbidity and mortality in Duchenne muscular dystrophy (DMD) due to both expiratory impairment with ineffective airway clearance, and inspiratory impairment leading to nocturnal and daytime hypoventilation and respiratory failure. Glucocorticoid steroids have become a mainstay of DMD therapy with well-documented efficacy on muscle strength and respiratory function. However, the side-effect profile restricts their long-term use, particularly in non-ambulant patients. Idebenone improves secondary mitochondrial dysfunction caused by dystrophin deficiency, intracellular calcium accumulation and increased reactive oxygen species (ROS). Idebenone-mediated improved bioenergetics leads to enhanced adenosine triphosphate (ATP) production and reduced ROS. Based on this rationale, idebenone has been investigated clinically for efficacy on reducing respiratory function decline in exploratory phase II (DELPHI) and confirmatory phase III (DELOS) trials. Idebenone significantly reduced the loss of respiratory function in 8–18-year-old DMD patients who were not using concomitant glucocorticoids. These results indicate that idebenone can modify the natural course of respiratory disease progression in DMD, which is relevant in clinical practice where loss of respiratory function continues to be a predominant cause of early morbidity and mortality in DMD. Gunnar M Buyse, Nuri Gueven and Craig M McDonald act as scientific consultants to Santhera Pharmaceuticals (Switzerland). Gunnar M Buyse was an investigator for clinical trials in Duchenne muscular dystrophy sponsored by GlaxoSmithKline, Prosensa and Santhera Pharmaceuticals and is Senior Clinical Investigator of the Research Foundation Flanders (FWO Vlaanderen, Belgium). He also is inventor of relevant patent applications. Craig M McDonald consulted on Duchenne muscular dystrophy clinical trials for Akashi Therapeutics, Biomarin, Bristol Myers Squibb, Cardero Therapeutics, Eli Lilly, Gilead, Italfarmaco, Mitobridge, Novartis, Pfizer, Prosensa, PTC Therapeutics, Santhera Pharmaceuticals and Sarepta Therapeutics. Compliance with Ethics: The analysis in this article is based on previously conducted studies, and does not involve any new studies of human or animal subjects performed by any of the authors. Santhera Pharmaceuticals was the sponsor of the DELPHI and DELOS trials and supported this publication. Duchenne muscular dystrophy (DMD) is the most common and devastating type of muscular dystrophy. Lack of the protein dystrophin causes severe and progressive myofibre degeneration, general muscle weakness and wasting. With increasing age, DMD patients are confronted with loss of ambulation, loss of upper limb function, cardiac dysfunction and dependence on mechanical airway clearance and mechanical assisted ventilation representing irreversible and lifechanging events of disease progression. Although early diagnosis and multi-stage disease management regimes (e.g. Bushby et al. )1,2 increase quality of life and life expectancy, the disease is still associated with early morbidity and mortality. In DMD, progressive weakness of the chest wall muscles precedes weakness of the diaphragm (used predominantly for inspiratory function) and leads to restrictive lung volume changes measured as reduced total lung capacity and forced vital capacity (FVC).3–7 Initially, this loss of lung volume results from the inability to pull up the respiratory system to total lung capacity and to push it down to residual volume. In later disease stages, additional restrictions occur as a result of progressing muscle fibrosis and changes in lung and chest wall recoil, thoracic wall compliance and spinal deformities (i.e. scoliosis). In the absence of obstructive pulmonary disease, FVC (measured in litres), peak expiratory flow (PEF, measured in l/minute), and forced expiratory volume in 1 second (FEV1, measured in litres) are major interrelated spirometry measures reflecting both inspiratory and expiratory muscle force impairment and restrictive lung volume changes due to neuromuscular weakness. 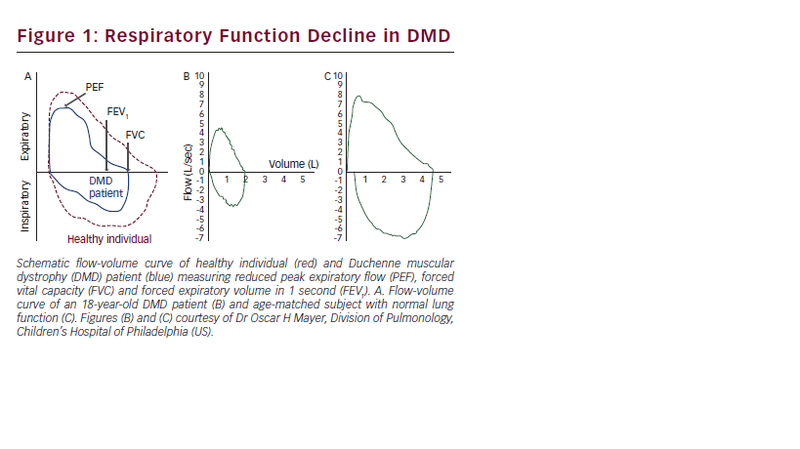 In DMD both inspiratory and expiratory respiratory weakness is indicated by abnormal flow-volume curves (see Figure 1). FVC is used to assess respiratory muscle involvement in many neuromuscular diseases, such as DMD. One may infer the presence of a restrictive ventilatory defect due to neuromuscular weakness when the FVC is reduced and the FEV1/FVC ratio is normal or increased. Previous studies have shown excellent test–retest reliability of FVC among DMD subjects. However, a limitation of FVC as a respiratory endpoint in DMD is that it is potentially affected by thoracic wall compliance/ fibrosis and thoracic deformities resulting from progressive scoliosis. FEV1 typically follows the decline measured in FVC. In the absence of obstructive pulmonary disease such as asthma, FEV1 is also an indicator of respiratory impairment due to neuromuscular weakness of combined inspiratory and expiratory weakness. In DMD patients who do not exhibit bronchial obstruction, PEF reflects expiratory muscle force.5 Abnormal respiratory mechanics in DMD are not limited to the lung and chest wall and may also involve the upper airways.6 Therefore, respiratory strength in DMD (assessed by PEF) is a measure not only of expiratory strength but also inspiratory effort and upper airway resistance, which are both abnormal in DMD.11,12 There is a theoretical possibility that PEF may be more sensitive to a treatment intervention than FVC due to the impact of fibrosis and chest wall deformities on FVC. All three of these measures – PEF, FVC and FEV1 – can be obtained with high reliability in DMD patients older than ~8 years. As respiratory function tests are influenced by body growth and age, these measures are typically normalised to height-matched (PEF)13 or height- and age-matched (FVC and FEV1)14 normative populations and expressed as ‘per cent predicted’ values (PEF%p, FVC%p, FEV1%p). A similar method of categorising the severity of lung function impairment based on the FEV1%p values has been described.19 These severity scores can be associated with performance, such as ability to work and function in daily life, morbidity and prognosis.20–23 A drop of FEV1%p to below 40 % was found to be a sensitive indicator of sleep hypoventilation in DMD.24 Thus, reduction in the rate of progression of FEV1%p would be of direct clinical value to a patient with DMD in terms of slowing pulmonary disease progression and decreasing the likelihood of developing carbon dioxide retention. controlled trials. At any time, approximately 40 % of DMD patients are either glucocorticoid-naïve or have discontinued treatment,32 due to glucocorticoid side effects and partial treatment effect, and this proportion even increases in the later post-ambulatory phase. Therefore, many patients are left without pharmacological treatment options at around the age when patients become non-ambulatory and the decline in respiratory function becomes clinically relevant. 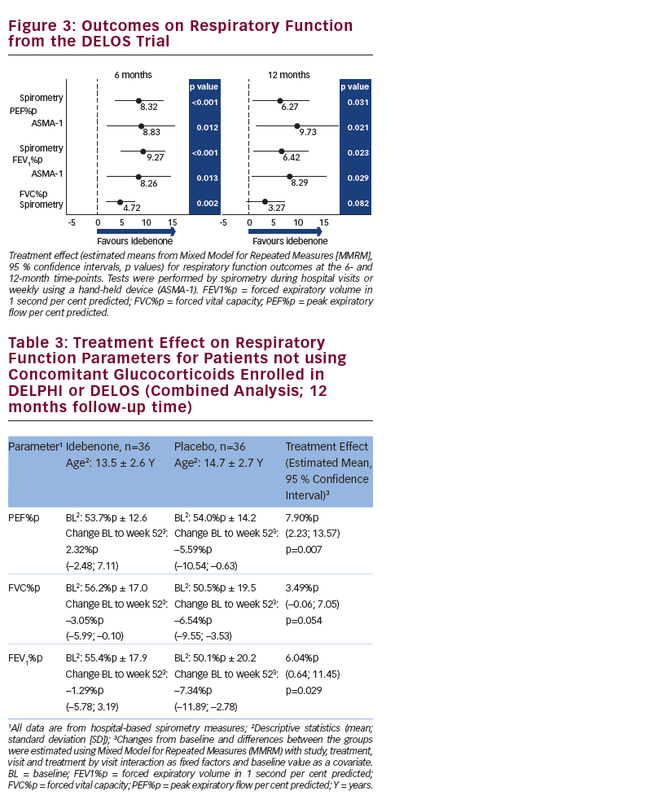 In summary, there is an unmet medical need for the management of respiratory function deterioration in DMD patients not taking glucocorticoids or in patients who do not respond to glucocorticoid treatment. The combination of primary dystrophin deficiency and secondary mitochondrial dysfunction and impaired muscle cell regeneration, degeneration and cell death is shown in Figure 2A. Muscle membrane injury caused by dystrophin deficiency leads to increased calcium influx and intracellular calcium accumulation. Thus, the primary pathogenesis results in increased ROS and damage to and dysfunction of mitochondria with subsequent depletion of mitochondria over time. Based on these findings, mitochondrial activation via stimulation of Complex II- or Complex III-mediated electron flux might be a therapeutic approach to overcome mitochondrial dysfunction in dystrophindeficient muscle. enters the mitochondria where it transfers its electrons to Complex III. This mechanism thereby bypasses complex I-dependent electron flow and as a result is able to produce ATP even in situations where Complex I is dysfunctional.60,62,63 Separately, idebenone has been reported to be a powerful inhibitor of ROS formation.61,65,66 The mode of action of idebenone is illustrated in Figure 2B, C.
Idebenone significantly increased the daily running distance of mdx mice and reduced cardiac inflammation and fibrosis in a long-term blinded placebo-controlled study.67 Idebenone also ameliorated cardiac diastolic dysfunction and reduced mortality from systolic cardiac pump failure in this model. Considering the generally accepted limitation of the mdx mouse as an animal model for DMD, these potential benefits on skeletal muscle degeneration, endurance, and cardiac function would need to be confirmed in patients with DMD. The exploratory phase II DELPHI study reported a better outcome on PEF%p in the idebenone-treated group compared with the placebo group when all patients (irrespective of their concomitant glucocorticoid use) were analysed.68 However, in a post-hoc analysis is was found that the treatment effect of idebenone on respiratory function outcomes was considerably larger in patients not using concomitant glucocorticoids.70 This could be explained by the protective effect of glucocorticoids, challenging a formal demonstration of an additive effect on top of steroids within the limitations of a human clinical trial. Although the number of patients in the subgroup of patients not using glucocorticoids was too small to allow a firm conclusion, the expected influence of concomitant glucocorticoid use was considered in the planning of the confirmatory phase III DELOS study. The study objective of DELOS was to test whether idebenone could slow the decline in respiratory function in patients with DMD not taking concomitant glucocorticoids.69 The 64 patients (age 10–18 years) randomised to idebenone (n=31) or placebo (n=33) treatment had washed out from previous glucocorticoid use prior to enrolment and did not use glucocorticoids for the treatment of the underlying disease during the 12-month follow-up period. The study met its primary endpoint demonstrating a statistically significant and clinically relevant treatment effect on PEF%p from baseline to month 12, which was supported by the consistency in results obtained for lung volume parameters (FVC%p, FEV1%p) at the 6- and 12-month time-points measured by hospital-based spirometry or at home using a hand-held ASMA-1 device (see Figure 3). Published natural history data confirm that PEF%p, FVC%p and FEV1%p all show a linear decline from age 10 onwards.28,29 The treatment effect of idebenone reported in DELOS for patients 10 years and older not using concomitant glucocorticoids on PEF%p, FVC%p and FEV1%p is equivalent to slowing respiratory decline by at least 1 year, which is clinically meaningful. In order to further assess the efficacy of idebenone in delaying the loss of respiratory function, data from glucocorticoid non-using patients enrolled in DELPHI and DELOS were combined for analysis (see Table 3). 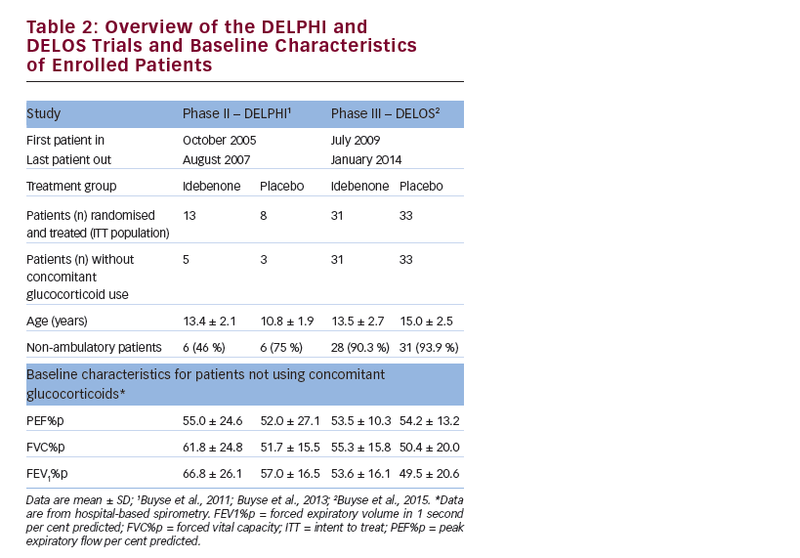 The combined analysis of all patients enrolled in DELPHI or DELOS demonstrated a significant decline in PEF%p from baseline to month 12 in the placebo group compared with a slight improvement in the idebenone group, resulting in a significant difference of 7.90%p in PEF%p between treatment groups. Similar combined analyses for FVC%p and FEV1%p revealed consistent treatment effects in favour of idebenone. 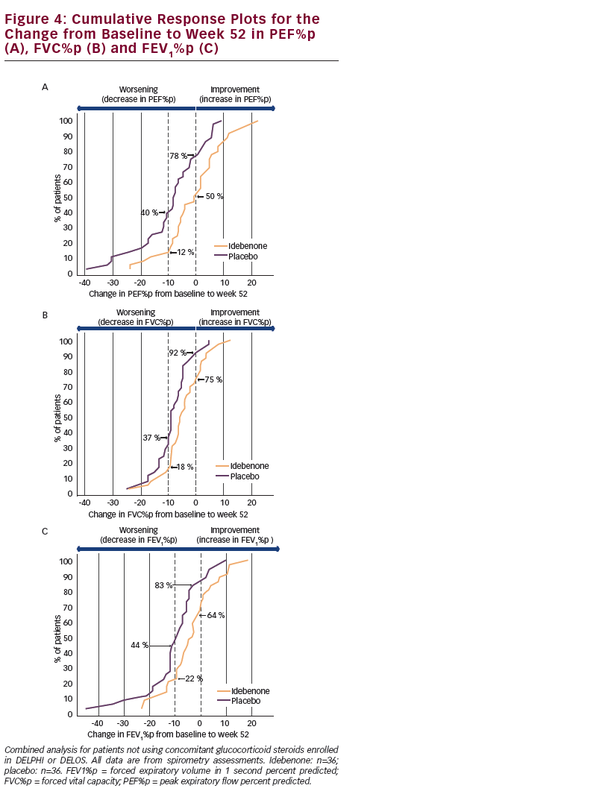 The consistency and robustness of the findings for the combined analyses is also demonstrated in cumulative response plots where the change from baseline to the 12 month (52 week) time-point is displayed for each patient (see Figure 4). For all three respiratory function parameters there is a clear separation of the curves for idebenone-treated patients from those in the placebo group. For PEF%p (see Figure 4A) there were fewer patients in the idebenone group who declined compared with placebo (50 % of patients in the idebenone group compared to 78 % in the placebo group declined in PEF%p). Likewise there were fewer patients in the idebenone group who declined in PEF%p by 10%p or more compared with the placebo group (12 % of patients in the idebenone group compared with 40 % in the placebo group). Similar patterns in favour of idebenone are also seen for FVC%p and FEV1%p (see Figure 4B, C). Although best practice guidelines on their dosing regimen are still lacking, glucocorticoids have beneficial effects and can slow disease progression particularly in younger, still ambulatory patients with DMD (e.g. Bushby et al. )1,2 However, not all patients benefit to the same extent from glucocorticoids and their benefit–risk profile in older, non-ambulatory patients still needs to be established. Therapeutic approaches to partially circumvent the effect of nonsense-mutations in the dystrophin gene or to partially correct dystrophin expression by exon skipping approaches are in advanced clinical investigation. So far, it appears that their therapeutic potential is best deployed when applied in younger, ambulatory patients with the goal to preserve muscle force and function. However, therapeutic options for older, non-ambulatory patients not able to use glucocorticoids are currently lacking, which comprises approximately 40 % of the entire DMD patient population 10 years and older.32 Based on the data from the randomised placebo-controlled studies summarised above, idebenone can be considered a suitable extension of the emerging landscape of treatment options for DMD. In DELOS, the firstever phase III trial in DMD with a positive outcome, significant and clinically relevant results for primary and secondary endpoints coherently showed that idebenone reduced the loss of respiratory function. Results from the DELOS study indicate that patients who previously used glucocorticoids for the treatment of the underlying disease but did no longer tolerate their use benefit from idebenone to the same extent as patients who never took glucocorticoids.69 This is an important observation as it shows that glucocorticoids and idebenone could be used sequentially in the same patient. Although data from the current trials were obtained primarily in patients not using glucocorticoids, there is no reason a priori why idebenone could not also be exerting a treatment effect in patients using glucocorticoids concomitantly. It remains to be seen whether longer-term administration of idebenone will show incremental benefits over glucocorticoid treatment with regard to stabilisation of pulmonary function. Likewise, in theory, idebenone treatment might be combined with different therapeutic approaches such as exon skipping or stop-codon read-through. However, at the current time it is premature to speculate about its possible use in conjunction with any such therapy approaches. Improved patient care with best-practice recommendations and the introduction of glucocorticoids has increased the quality of life and survival time of patients with DMD. Nevertheless, with increasing age loss of respiratory function continues to be a predominant cause of early morbidity and mortality. Efficacy data from randomised placebocontrolled phase II and III trials show that idebenone significantly reduced the loss of respiratory function in 8–18 year old patients who were not taking concomitant glucocorticoids. Considering its favourable safety and tolerability profile, this oral medication could therefore become the first treatment option for patients not using glucocorticoids with the possibility to ameliorate a life-threatening complication in the ageing population of DMD patients. 1. Bushby K, Finkel R, Birnkrant DJ, et al., Diagnosis and management of Duchenne muscular dystrophy, part 1: diagnosis, and pharmacological and psychosocial management, Lancet Neurol, 2010;9:77–93. 2. Bushby K, Finkel R, Birnkrant DJ, et al., Diagnosis and management of Duchenne muscular dystrophy, part 2: implementation of multidisciplinary care, Lancet Neurol, 2010;9:177–89. 3. McDonald CM, Abresch RT, Carter GT, Profiles of neuromuscular diseases, Am J Phys Med Rehabil, 1995;74: S70–S94. 4. Hahn A, Bach JR, Delaubier A, et al., Clinical implications of maximal respiratory pressure determinations for individuals with Duchenne muscular dystrophy, Arch Phys Med Rehabil, 1997;78:1–6. 5. Suárez AA, Pessolano FA, Monteiro SG, et al., Peak flow and peak cough flow in the evaluation of expiratory muscle weakness and bulbar impairment in patients with neuromuscular disease, Am J Phys Med Rehabil, 2002;81:506–11. 6. Vincken WG, Elleker MG, Cosio MG, Flow-volume loop changes reflecting respiratory muscle weakness in chronic neuromuscular disorders, Am J Med, 1987;83:673–80. 7. Griggs RC, The use of pulmonary function testing as a quantitative measurement for therapeutic trials, Muscle & Nerve, 1990;Suppl.:30–4. 8. Inkley SR, Oldenburg FC, Vignos PJ, Pulmonary function in Duchenne muscular dystrophy related to stage of disease, Am J Med, 1974;56:297–306. 9. Rideau Y, Jankowski LW, Grellet J, Respiratory function in the muscular dystrophies. Muscle & Nerve, 1981;4:155–64. 10. Khan Y, Heckmatt JZ, Obstructive apnoeas in Duchenne muscular dystrophy, Thorax, 1994;49:157–61. 11. Tzelepis GE, Zakynthinos S, Vassilakopoulos T, et al., Inspiratory maneuver effects on peak expiratory flow: Role of lung elastic recoil and expiratory pressure, Am J Respir Crit Care Med, 1997;156:1399–404. 13. Quanjer PH, Stocks J, Polgar G, et al., Compilation of reference values for lung function measurements in children, Eur Respir J Suppl, 1989;Suppl. 4:184S–261S. 14. Hankinson IL, Odencrantz JR, Fedan KB, Spirometric reference values from a sample of the general U.S. population, Am J Respir Crit Care Med, 1999;159:179–87. 15. Finder JD, Birnkrant D, Carl J, et al., Respiratory care of the patient with Duchenne muscular dystrophy: ATS consensus statement, Am J Respir Crit Care Med, 2004;170:456–65. 16. Birnkrant DJ, Panitch HB, Benditt JO, et al., American College of Chest Physicians consensus statement on the respiratory and related management of patients with Duchenne muscular dystrophy undergoing anesthesia or sedation, Pediatrics, 2007;132:1977–86. 17. Birnkrant DJ, Bushby KMD, Amin RS, et al., The respiratory management of patients with Duchenne muscular dystrophy: A DMD care considerations working group specialty article, Pediatr Pulmonol, 2010;45:739–48. 18. Phillips MF, Quinlivan RCM, Edwards RHT, Calverley PM, Changes in spirometry over time as a prognostic marker in patients with Duchenne muscular dystrophy, Am J Respir Crit Care Med, 2001;164:2191–4. 20. Becklake MR, Helms R, Lebowitz MD, et al., NHLBI workshop summary. Longitudinal analysis in pulmonary disease epidemiology, Am Rev Respir Dis, 1988;137:1241–3. 21. Kanner RE, Renzetti AD, Stanish WM, et al., Predictors of survival in subjects with chronic airflow limitation, Am J Med, 1983;74:249–55. 22. 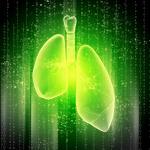 Traver GA, Cline MG, Burrows B, Predictors of mortality in chronic obstructive pulmonary disease. A 15-year follow-up study, Am Rev Respir Dis, 1979;119:895–902. 23. Anthonisen NR, Wright EC, Hodgkin JE, Prognosis in chronic obstructive pulmonary disease, Am Rev Respir Dis, 1986;133:14–0. 24. Hukins CA, Hillmann DR, Daytime predictors of sleep hypoventilation in Duchenne Muscular Dystrophy, Am J Respir Crit Care Med, 2000;161:166–70. 25. Gauld LM, Boynton A, Relationship between peak cough flow and spirometry in Duchenne muscular dystrophy, Pediatr Pulmonol, 2005;39:457–60. 26. Bach JR, Ishikawa Y, Kim H, Prevention of pulmonary morbidity for patients with Duchenne muscular dystrophy, Chest, 1997;112:1024–8. 27. Tzeng AC, Bach JR, Prevention of pulmonary morbidity for patients with neuromuscular disease, Chest, 2000;118:1390–6. 28. Abresch RT, McDonald CM, Henricson EK, et al., Pulmonary function characteristics of boys with Duchenne Muscular Dystrophy : Data from the CINRG longitudinal study project, Neuromuscul Disord, 2013;23:802. 29. Mayer OH, Finkel RS, Rummey C, et al., Characterization of pulmonary function in Duchenne Muscular Dystrophy, Pediatr Pulmonol, 2015;50:487–94. 30. Moxley RT, Ashwal S, Pandya S, et al., Practice parameter: corticosteroid treatment of Duchenne dystrophy: report of the Quality Standards Subcommittee of the American Academy of Neurology and the Practice Committee of the Child Neurology Society, Neurology, 2005;64:13–20. 31. Biggar WD, Gingras M, Fehlings DL, Deflazacort treatment of Duchenne muscular dystrophy, J Pediatr, 2001;138:45–50. 32. Henricson EK, Abresch RT, Cnaan A, et al., The cooperative international neuromuscular research group Duchenne natural history study: Glucocorticoid treatment preserves clinically meaningful functional milestones and reduces rate of disease progression as measured by manual muscle testing and other commonly used clinical trial outcome measures, Muscle & Nerve, 2013:48:55–67. 33. Biggar W D, Harris V, Eliasoph L, Long-term benefits of deflazacort treatment for boys with Duchenne muscular dystrophy in their second decade. Neuromuscul Disord, 2006;16:249–55. 34. King WM, Ruttencutter R, Nagaraja HN, et al., Orthopedic outcomes of long-term daily corticosteroid treatment in Duchenne muscular dystrophy, Neurology, 2007;68:1607–13. 35. Manzur A, Kuntzer T, Pike M, Swan A, Glucocorticoid corticosteroids for Duchenne muscular dystrophy, Cochrane Database Syst Rev, 2008;1:1–72. 36. Connolly AM, Schierbecker J, Renna R, Florence J, High dose weekly oral prednisone improves strength in boys with Duchenne muscular dystrophy, Neuromuscul Disord, 2002;12:917–25. 37. Abresch RT, McDonald CM, Henricson EK, et al., Pulmonary function characteristics of boys with Duchenne Muscular Dystrophy by age groups, ambulatory status and steroid use, Neuromuscul Disord, 2013;23:801–2. 38. Cardoso SM, Pereira C, Oliveira R, Mitochondrial function is differentially affected upon oxidative stress, Free Radic Biol Med, 1999;26 3–13. 39. Brookes PS, Yoon Y, Robotham JL, et al., Calcium, ATP, and ROS: a mitochondrial love-hate triangle, Am J Physiol Cell Physiol, 2004;287:C817–33. 40. Peng TI, Jou MJ, Oxidative stress caused by mitochondrial calcium overload, Ann N Y Acad Sci, 2010;1201: 183–188. 41. Dunn JF, Radda GK, Total ion content of skeletal and cardiac muscle in the mdx mouse dystrophy: Ca2+ is elevated at all ages, J Neurol Sciences, 1991;103:226–31. 42. Culligan K, Ohlendieck K, Abnormal calcium handling in muscular dystrophy, Basic Appl Myol, 2002;12: 147–157. 43. Scholte HR, Luyt-Houwen I, Bush H, Jennekens F, Muscle mitochondria from patients with Duchenne muscular dystrophy have a normal beta oxidation, but an impaired oxidative phosphorylation, Neurology, 1985;35:1396–7. 44. Lucas-Heron B, Schmitt N, Ollivier B, Muscular dystrophy: possible role of mitochondrial deficiency in muscle degeneration processes, J Neurol Sci, 1990;95:327–34. 45. Even PC, Decrouy A, Chinet A. Defective regulation of energy metabolism in mdx-mouse skeletal muscles, Biochem J, 1994;304:649–54. 46. Sperl W, Skladal D, Gnaiger E, et al., High resolution respirometry of permeabilized skeletal muscle fibers in the diagnosis of neuromuscular disorders, Mol Cell Biochem, 1997;174:71–8. 47. Kuznetsov AV, Winkler K, Wiedemann FR, Impaired mitochondrial oxidative phosphorylation in skeletal muscle of the dystrophin-deficient mdx mouse, Mol Cell Biochem, 1998;183:87–96. 48. Passaquin AC, Renard M, Kay L, Creatine supplementation reduces skeletal muscle degeneration and enhances mitochondrial function in mdx mice, Neuromuscul Disord, 2002;12:174–82. 49. Onopiuk M, Brutkowski W, Wierzbicka K, et al., Mutation in dystrophin-encoding gene affects energy metabolism in mouse myoblasts, Biochem Biophys Res Commun, 2009;386:463–6. 50. Godin R, Daussin F, Matecki S, et al., Peroxisome proliferatoractivated receptor γ coactivator1- gene α transfer restores mitochondrial biomass and improves mitochondrial calcium handling in post-necrotic mdx mouse skeletal muscle, J Physiol, 2012;590:5487–502. 51. Schuh RA, Jackson KC, Khairallah RJ, et al., Measuring mitochondrial respiration in intact single muscle fibers, Am J Physiol Regul Integr Comp Physiol, 2012;302:R712–R719. 52. Percival JM, Siegel MP, Knowels G, Marcinek DJ, Defects in mitochondrial localization and ATP synthesis in the mdx mouse model of Duchenne muscular dystrophy are not alleviated by PDE5 inhibition, Hum Mol Genet, 2013;22:153–67. 53. Cole M., Rafael J, Taylor DJ, et al., A quantitative study of bioenergetics in skeletal muscle lacking utrophin and dystrophin, Neuromuscul Disord, 2002;12:247–57. 54. Rybalka E, Timpani CA, Cooke MB, et al., Defects in mitochondrial ATP synthesis in dystrophin-deficient mdx skeletal muscles may be caused by Complex I insufficiency, PLoS ONE, 2014;9:e115763. 55. 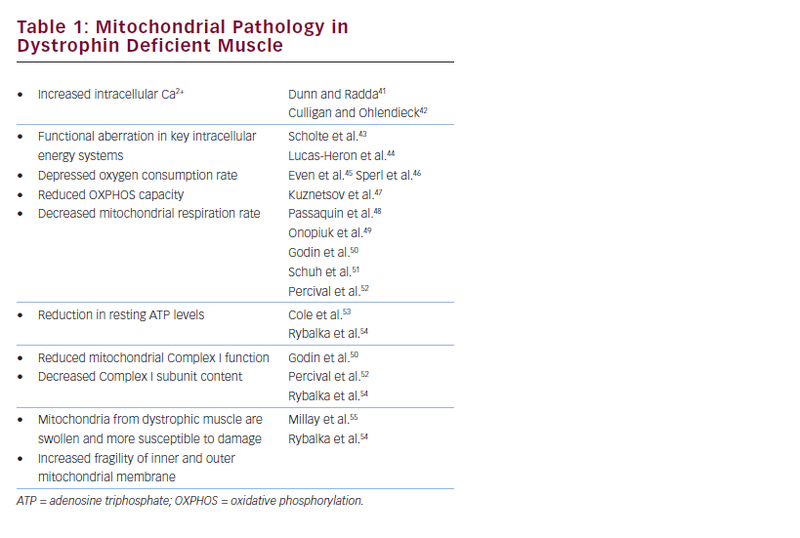 Millay DP, Sargent MA, Osinska H, et al., Genetic and pharmacologic inhibition of mitochondrial-dependent necrosis attenuates muscular dystrophy, Nature Medicine, 2008;14:442–7. 56. Selsby JT, Morine KJ, Pendrak K, et al., Rescue of dystrophic skeletal muscle by PGC-1alpha involves a fast to slow fiber type shift in the mdx mouse, PLoS ONE, 2012;7:e30063. 57. Chen YW, Zhao P, Borup R, Hoffman EP, Expression profiling in the Muscular Dystrophies: Identification of novel aspects of molecular pathophysiology, J Cell Biol, 2000;151:1321–36. 58. Timmons JA, Larsson O, Jansson E, et al., Human muscle gene expression responses to endurance training provide a novel perspective on Duchenne Muscular Dystrophy. FASEB J, 2005;19:750–60. 59. Gueven N, Woolley K, Smith J, Border between natural product and drug: Comparison of the related benzoquinones idebenone and coenzyme Q10, Redox Biology, 2015;4:289–95. 60. Jaber S, Polster BM, Idebenone and neuroprotection: antioxidant, pro-oxidant, or electron carrier?, J Bioenerg Biomembr, 2014;47:111–8. 61. Rauchová H, Vrbacký M, Bergamini C, et al., Inhibition of glycerophosphate-dependent H2O2 generation in brown fat mitochondria by idebenone, Biochem Biophys Res Commun, 2006;339:362–6. 62. Haefeli R H, Erb M, Gemperli AC, et al., NQo1-dependent redox cycling of idebenone: Effects on cellular redox potential and energy levels, PLoS ONE, 2011;6. 63. 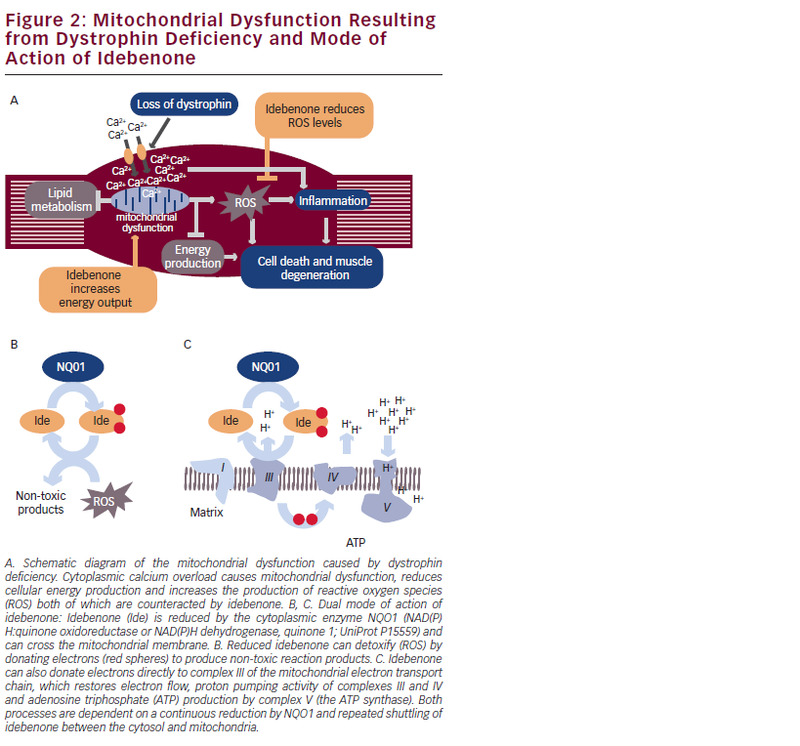 Giorgio V, Petronilli V, Ghelli A, et al., The effects of idebenone on mitochondrial bioenergetics, Biochim Biophys Acta, 2012;1817:363–9. 64. Erb M, Hoffmann-Enger B, Deppe H, et al., Features of idebenone and related short-chain quinones that rescue ATP levels under conditions of impaired mitochondrial complex I, PLoS ONE 2012;7. 65. Mordente A, Martorana GE, Minotti G, Giardina B, Antioxidant Properties of 2 , 3-Dimethoxy-5-methyl- 6- (10-hydroxydecyl) -1 , 4-benzoquinone (Idebenone), Chem Res Toxicol, 1998;11:54–63. 66. Gil J, Almeida S, Oliveira CR, Rego AC, Cytosolic and mitochondrial ROS in staurosporine-induced retinal cell apoptosis, Free Radic Biol Med, 2003;35:1500–14. 67. Buyse GM, Van Der Mieren G, Erb M, et al., Long-term blinded placebo-controlled study of SNT-MC17/idebenone in the dystrophin deficient mdx mouse: Cardiac protection and improved exercise performance, Eur Heart J, 2009;30:116–24. 68. Buyse GM, Goemans N, van den Hauwe M, et al., Idebenone as a novel, therapeutic approach for Duchenne muscular dystrophy: Results from a 12 month, double-blind, randomized placebo-controlled trial, Neuromuscul Disord, 2011;21:396–405. 69. Buyse GM, Voit T, Schara U, et al., Efficacy of idebenone on respiratory function in patients with Duchenne muscular dystrophy not using glucocorticoids (DELOS): a doubleblind randomised placebo-controlled phase 3 trial, Lancet, 2015;385: 1748–57. 70. Buyse GM, Goemans N, Van Den Hauwe M, Meier T, Effects of glucocorticoids and idebenone on respiratory function in patients with duchenne muscular dystrophy, Pediatric Pulmonology, 2013;48:912–20.